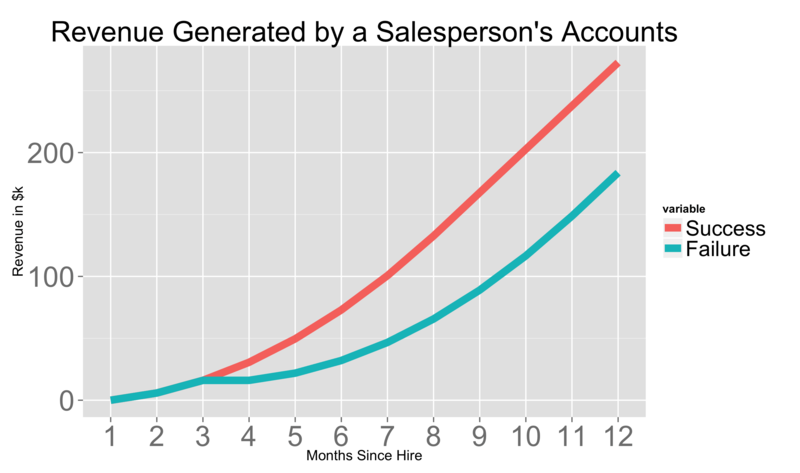 The chart above compares the contribution of two hypothetical inside sales people with $400,000 quotas to an early-stage startup’s finances. In this case, contribution is the 18 month revenue of sold customers tallied cumulatively minus the salary costs of $100k annualized of the sales person. I’ve modeled a six month linear ramp for the sales person to reach 100% of quota. 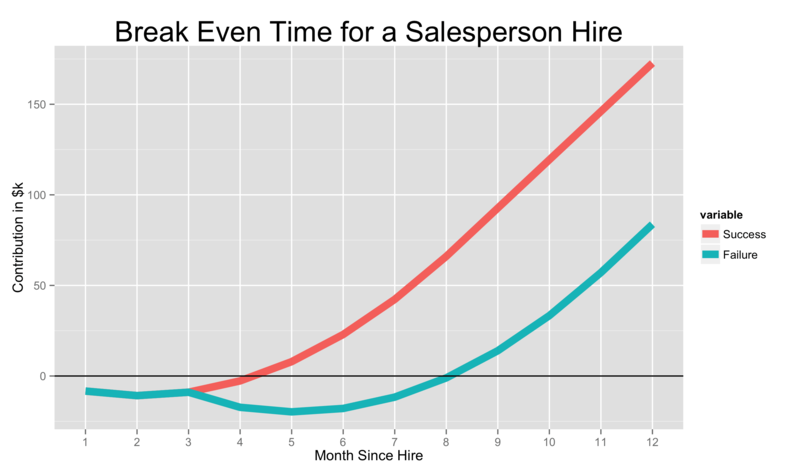 The red line shows the case for a successful sales hire. Through the first three months, as the salesperson ramps, his contribution to the business is negative because his salary costs outweigh the lifetime value of his sales. Note, I haven’t included the recruiting costs here, just wages and commission. Starting in the fourth month, new customers closed by the salesperson begin to offset his costs and by month 5, the company is better-than-breakeven on the hiring decision on a customer lifetime value basis. The blue line shows the impact of the bad hire. The wrong person is initially hired and fired in month 3 and immediately thereafter, a successful candidate is found. Because the startup must incur the quota ramp again, the contribution dips 2x lower than in the success case, about -$20k in month 5, and the investment on sales hiring isn’t recouped until 8 months after the initial hire. This stutter-step also has an impact on the revenue trajectory of the business as shown by the chart above. The hypothetical failed sales hire delays the revenue of the business by 3 months. As a company’s revenues grow and the number of people within the salesteam increases, these effects become less and less important. But at the beginning, the impact to the trajectory of a business can be material.